…you shall all burn in Hell, however. For the religious among us who choose to believe lies, the so-called experts at Wikipedia have an article about Shrimp. Shrimp: tiny, foul-tasting harbingers of doom vegetable. Seemingly made from vulcanised rubber, scientific evidence suggests they are completely inedible by the human being, and any belief to the contrary is easily dismissed as the libelous drivel of the truly deranged. 1 What Do Shrimp Look Like? What Do Shrimp Look Like? Take a short person. Paint them pink. Give them extra legs and creepy little black eyes. That's a shrimp. 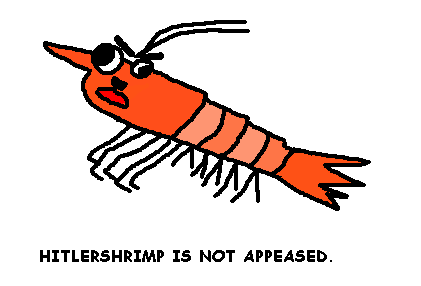 The nazi shrimp also were Secretly escorting 8 billion pounds of huffable kittens.Shrimp have no lungs so why would they do that? some speculate that they were giving it to grues ,speranah,or various noobs. (benitso mussolini was a noob at bike racing)No one knows. Unfortunately, this second fish war was very violent and it resulted in the death of many fish. It also resulted in the opening of "Fish Buffet", an organization opened specifically for dolphins. Well, that's a very good question. Currently, the only scientific answer is "Why not?" This is laughably insufficient. Numerous religions have their own interpretations of this question. Christianity: As punishment for our sins. Islam: As punishment for our sins. Buddhism: It's where you are reincarnated if you're really a very nasty person. This page was last edited on 5 April 2011, at 21:31.